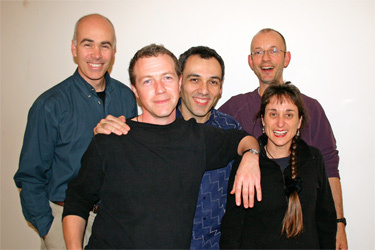 After 14 years, Mooncoin played their final gig a sell out at the Norwich Arts Centre on 31st January 2008, at which they also released their final CD "Janus". We are now back to a 4-piece band following the departure of Cesar from the band. The last time we went to CB2 (Saturday 3rd February last) Bernard Hoskins recorded one of our numbers on video and another on audio and then put them up on the acoustic routes web site. Chris continues to knit socks and water the garden. Pictures of the latter are promised... Or maybe even of laying foundations for a new garden fence. Mooncoin played earlier in the year at the Waveney Folk Club (Lowestoft), the Colchester Folk Club and the Bishop Stortford Music Festival. Mooncoin's first official concert with their new line up was at the St Neots Folk Club on February 7th. But before that they played a short set at a Tsunami anniversary fund raising appeal held at St Andrew's Hall in Norwich Norwich. During November Mooncoin undertook their successful farewell tour with the former line up. During the tour they visited the likes of Norwich, Halesworth, Cambridge and Hopton. Earlier in the year Mooncoin played in front of a packed house at both the Folk On the Pier and at the Norwich05 festivals. Before that they played at the Hoy at Anchor Folk club, in Leigh on Sea, and on whose web site it says "One of our Committee members describes Mooncoin as the best new band he'd seen in well over a year. " - looks like they have some very discerning committee members. At at the start of the year Members of Mooncoin, Chris, Uli and Paul were honoured to be able join many of the top names on the Norfolk folk scene for a giant "Drop In The Ocean" charity folk dance in aid of a Tsunami Flood Relief Appeal held at St Andrew's Hall in Norwich. That event was put together and compered by TV historian and folksinger Bryan McNerne, and over £13,500. At that gig Mooncoin the members were joined by Bev and who is now joining as a regular band member. Another busy year for Mooncoin. They played at the Saul 'Folk in the Water' Canal Festival, Ely Folk Weekend, Priddy Folk Festival and Warwick Folk Festival amongst others, and also played a gig in Nürnberg, Germany. Chris put her knitting down long enough to finally written down the lyrics to the songs on A Fathomless Sea. Mooncoin are one of most entertaining and exciting groups on the scene today. They take their audience on a musical journey across Europe taking in the musical traditions of Ireland, England, Sweden and Eastern Europe and even take a brief trip over to the USA to do songs by Woody Guthrie and Joni Mitchell. All this is done with intricate arrangements and a musical virtuosity that never gets in the way of a good song or tune or the sense of fun that they share with the audience. Their music is distinctive and original but always accessible to a wide range of tastes. We had a great night with them at Acoustic Routes and look forward to having them back. Highly recommended. Praise indeed, and just demonstrates what an entertaining live band Mooncoin are. Click here to hear them perform live at that performance. Mooncoin were joined by guest bass guitarist Cesar Camba . He made his first appearance with Mooncoin at their ArtsAcoustic gig at the Norwich Arts Centre on the 5th October. In September Mooncoin played their 10th Anniversary Concert, with support from Babelfish, to a packed audience at the Norwich Arts Centre. Babelfish featuring Tim Nash originally with Mooncoin, joined Mooncoin back on stage at the end of the evening and performed a few numbers together. Excellent. Skryp' grew a new beard. Well, he managed to lose his razor whilst on tour in Germany and hasn't yet had the time to replace it. So, if any one has a spare razor he would particularly welcome one! In early July Mooncoin played at the Rudolstadt Folk Festival in Germany. Whilst at Rudolstadt, Mooncoin were also invited to a live radio interview with MDR (Mittel Deutscher Rundfunk), where they performed Bucimis live and advertised their forthcoming tour in Germany. Mooncoin had a good reception there and managed to sell over 60 CDs, including Spinndrift, their third album. Mooncoin released their third album 'Spinndrift' and which was officially launched at a gig at the Norwich Arts Centre, where they were supported by Mary-Jane Evans and Skryp'. You can listen to a couple of sample tracks off this CD by visiting Our CDs.